Roma center for Democracy is a lead partner organization in the regional Project „SE Europe Transnational CSO Coalition for Women and Child Protection Against Human Trafficking and Gender-based Violence – STOP“(Ref: 2015/370-114) which is implemented by: Roma Center for Democracy from Serbia, Partnerë për Fëmijët from Albania, Vivažene from Bosnia and Herzegovina, Centre for Peace and Tolerance from Kosovo financed by European Union. In the frame of the project, Roma center for Democracy will organize three trainings for the civil society representatives about Gender based Violence (GBV) and Human trafficking (HT). The concrete topics are specified below in the text. For this purpose, Roma center for Democracy is seeking for two qualified and experienced trainers to do trainings for the CSOs representatives from Serbia. The specifics for this call are stated below. Preferred period of delivering the trainings: first training – second part of December 2017, second and third trainings – first part of 2018. To deliver three 3-day trainings on gender based violence and human trafficking to representatives from civil society organizations in Serbia. It is expected from the expert to be present at the whole training days. Dates of the trainings: First training - second part of December 2017. The other two trainings will be held during 2018. The dates will be additionally confirmed. The key goal of the trainings are to inspire CSOs to work better to address human trafficking and GBV and to focus on implementing their advocacy and networking action plans. Need assessment – The Roma center for Democracy did a research with purpose to assess the capacities of the civil society organizations in Serbia. The received data is used to assess the level of capacity and strengths of the CSOs in relation to human trafficking, GBV, smuggling and child protection as a base for further development of the training modules which will be focused on human trafficking and gender-based violence as general topics with specifics created according to CSOs answers. A brief report based on the findings was prepared and it will be shared with the trainers in order to better prepare the trainings’ programme. Development and implementation of Training Modules – The details of training programs will be developed by external trainers in cooperation with the project coordinator according to the needs assessment. Capacity building of lobby and advocacy skills. Each participant will have a greater understanding of the gender based violence and human trafficking with special focus on the specific topics which are explained above and will be additionally added as relevant to the training programmes. To prepare the training modules and agendas based on the needs assessment and in cooperation with the project coordinator. The training programme should be delivered on Serbian language. To prepare training materials and these will be delivered to the participants at the trainings. The training materials should be delivered on Serbian language. 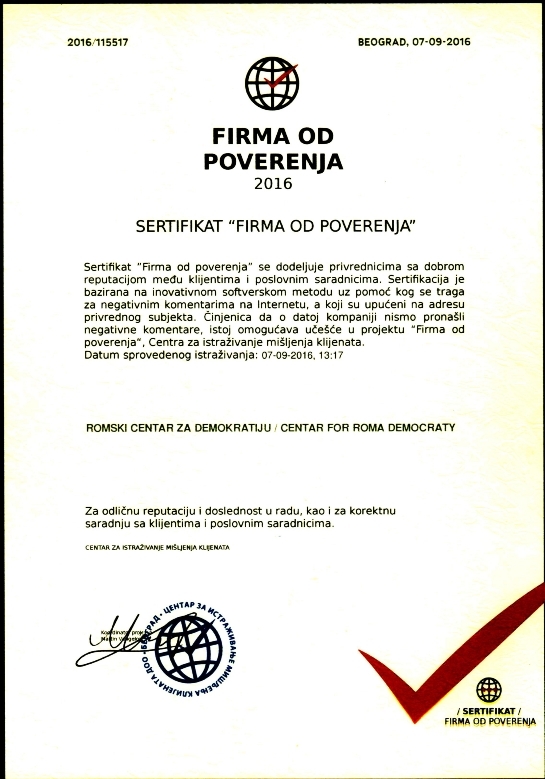 Printing of the material and other training materials will be provided by Roma center for Democracy. To held the trainings in pair (meaning two trainers per training). The language of delivering the training is Serbian. The trainings should be a mix of teaching and practical work – group work and discussions. The trainings will also be attended by representative’s form Roma center for Democracy. To deliver a narrative report upon the completion of each training by each of the trainers. The report should be prepared in English and should provide recommendations for future strengthening the capacities of the CSOs in the topics. To prepare pre and post evaluation forms and the results of them should be also part of their narrative reports. The engagement will be for two trainers for three trainings for three days (two days training and one day for preparation and reporting). Each training day, must last at minimum 8 working hours. The number of working days is 18 in total, meaning 2 trainers * 9 working days (minimum 144 working hours). The proposed fee is 100 EURO gross amount per day expressed in the national currency. The payment will be made in Serbian RSD. The incurred taxes will be deducted from the total gross amount, as per the governing laws. Personal documents will be required from the selected candidate in order to complete the Contract and payment. The payment will be made after ach training by delivering the trainer’s narrative report and approved by the project coordinator in a time frame agreed in accordance with the Contract. Excellent analytical, oral and written communication skills in Serbian. Fluent in English (written, spoken, understanding), knowledge of Albanian language will be considered as an advantage.